Platinum recording artist, SHIM has announced a release date for his self-titled solo album, SHIM – September 14 on BFD, distributed worldwide by The Orchard. 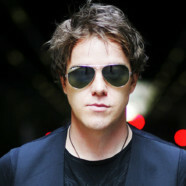 After creating a worldwide fan base as founder and former lead vocalist for Sick Puppies, the Australia-born singer, songwriter and producer found himself back at square one, and after a couple failed attempts at collaborating again, decided to bet on himself. Pre-order the digital album starting August 31, and receive instant downloads of “A Brave New War” and “Hallelujah” from Apple and Amazon.